Intel's upcoming Cannonlake chips will deliver a performance improvement as the company looks to gaming and VR. Upgrading CPU performance hasn’t been a priority for Intel in many years, but that could be changing. Intel’s upcoming Cannonlake chips will deliver a performance improvement of more than 15 percent compared to its Kaby Lake chips, said Venkata Renduchintala, president of the Intel Client and Internet of Things businesses and Systems Architecture Group. Intel didn’t provide exact numbers at the company’s annual investor day Thursday, but the projection is based on the SysMark benchmark. Detailed performance improvement numbers will emerge over time. A slide from Intel's investor day shows Intel's projected roadmap toward its 8th-gen "Cannonlake" chip. 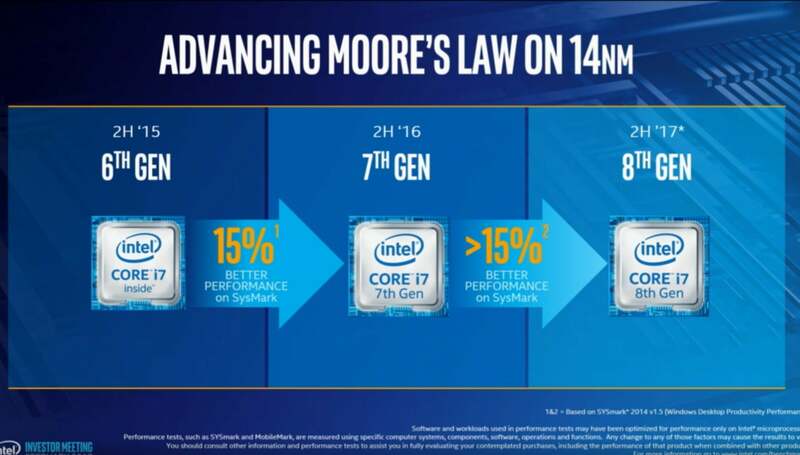 The performance improvements from Skylake to Kaby Lake topped out at 15 percent. The CPU performance boost for Cannonlake should be at least that, Intel said. The first Cannonlake chips are scheduled to ship in the second half of this year. The chips—called 8th-generation chips on an Intel slide—could include Core i7 chips. Intel showed a Cannonlake chip at CES. The chip will be the first made on Intel’s 10-nanometer process, which will deliver a substantial reduction in power consumption, Renduchintala said. Intel may be trying to catch up with AMD, which is boasting a 40 percent performance improvement for its upcoming Ryzen chips. Ryzen’s numbers are based on IPC (instructions per cycle), an important performance metric. The benefit of high-performance PC chips isn’t lost on Intel. The gaming market is exploding, especially eSports, and demand for high-performance Core i7 chips skyrocketed last year, Renduchintala said. As markets like virtual reality heat up, buyers will be motivated to upgrade to Core i7 chips from Core i3 chips. The Core i7 chips today are up to 36 percent faster than Core i3 chips, Renduchintala said. Chipmakers in past years focused on increasing performance by raising the clock frequency. But that made chips power hungry, and their focus shifted to adding cores, which boosted performance but also added battery life to laptops. Then the focus turned to integrating technologies like graphics and I/O buses inside processors. Gaming and virtual reality have brought a focus back to raw CPU performance. There’s a limited scope for growth in the PC market, with gaming and VR being the bright spots, and both right now require high-performance CPUs. Unlike in the past, Intel doesn’t want to sell low-margin chips that would ultimately incur a loss. Intel was “disciplined” with its PC business, and the focus was on high-margin products like Core i7 chips. Intel’s highest priced PC chip is the Core i7-6950X, which is priced at US$1,723, and it generates a high profit margin for Intel. But Intel will have to contend with AMD, which is coming on strong with Ryzen. Analysts say Ryzen will start off strong in high-end gaming PCs based on the early hype, but then its success will depend on word-of-mouth recommendations. Ryzen’s subsequent success in consumer laptops and desktops will depend on PC makers adopting the chip.